Use the Bobcat MT85 for public works and parks and recreation tasks. It also works well on landscaping, construction, buildings and grounds, and agriculture/forestry applications. The Bobcat MT85 boasts plenty of power, lifting capability and stability. It enables operators to efficiently complete everyday or challenging tasks in limited-space jobsites. Use it for public works and parks and recreation tasks. It also works well on landscaping, construction, buildings and grounds, and agriculture/forestry applications. The mini track loader can turn within its tracks, with minimal turf damage, to complete projects where larger machines can’t fit. Choose between two widths — 36 inches with narrow tracks or 44 inches with wide tracks — to best match the application. The unit’s compact size, which is ideal for traveling through fence gates, backyard projects or other tight areas, makes the model a good choice to replace tasks previously done with manual labor and hand tools. The unit offers good attachment versatility. Owners can use the MT85 as a stand-alone machine or pair it with other Bobcat compact equipment to complete a variety of projects. 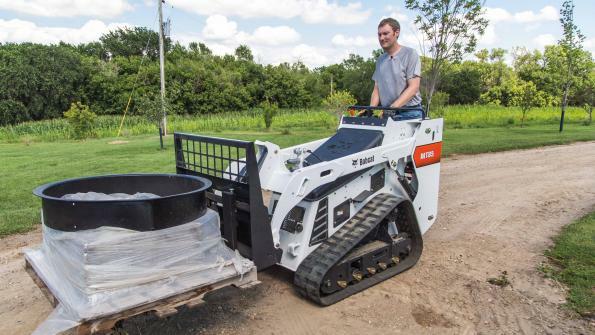 The mini track loader has a 35 percent higher rated operating capacity (ROC) than prior mini track loader iterations — rated at 850 pounds — to lift, carry and dump materials. MT85 operators can lift materials higher with an increase of 12 percent in lift height. For hard digging conditions, the lift arm breakout force has been increased by 29 percent from the company’s smaller MT55 mini track loader. The model is taller, with greater ground clearance than the company’s earlier models. It has an additional 6 inches of track length on the ground for added stability. The machine’s hydraulic system produces fast cycle times, good tractive effort, strong hydraulic breakout force, and efficient pushing and digging abilities. The MT85 is designed with dual ISO joystick controls. The loader’s left-hand joystick controls the unit’s drive function. The right-hand joystick controls the loader’s lift and tilt functions. Gauges and dials on the loader’s dash panel remain unchanged from those on the MT55. A new operator presence / safety pedal regulates the auxiliary hydraulic flow for use with approved attachments. The pedal must be engaged when the operator is using an attachment with detent hydraulic flow, such as trenching, snowblowing, digging holes with an auger or pushing / sweeping material with an angle broom.